Entrepreneurs are change artists. They create and innovate. They spot opportunity and know what to do about it. They build, establish a new order of things and in so doing they bring increase. They challenge the status quo with better solutions to problems and they know how to do so at a profit. The Jewish perspective in viewing these prime entrepreneurial characteristics, of creating and bringing increase entails even more. A finely honed stewardship is one of the unique dimensions of Jewish business secrets. A vital element of the stewardship that has endured within Jewish culture that triggers the creative to bring increase is a form of generosity. This dynamic is described best by the Hebrew word tz’dakah. Tz’dakah can be translated either as righteousness or charity. In reality it encompasses something from each of these English words. For centuries for the Jewish people, tz’dakah has been a community dynamic, a targeted generosity that helps those in the community in need, while simultaneously building the community, with a focus on strengthening the emerging generation. For the entrepreneur this involves “giving back,” not only when success comes, but all along the way. I’ve previously shared from the words of the psalmist that: “All goes well for the generous man, who lends freely and conducts his business fairly.” In the same writings it also says that: “Such people give generously to those in need and their righteous deeds will never be forgotten.” This perspective, this community generosity, bonds one generation to another with new generations embracing an excellence that exceeds the generation before it. There is a Jewish proverb that states that: “Righteousness exalts a nation.” The Hebrew for righteousness is this word tz’dakah. A more correct translation would be that: “Righteous charity exalts a nation.” In other words, the practice of generosity within the community operates as a process, then spills over to benefit the overall community bringing blessings to all. It finds its origins in the mantle of Abraham, to be blessed to be a blessing. This way of thinking is significant within Jewish mind-sets and the secrets of doing business as the Jews do. It is engrained in Jewish culture. Having been involved in helping several initiatives in Israel, I’ve observed that even non-practicing Jews operate as walking Torahs, of being living examples of the truths of their faith. Indeed, the principles outlined by Moses that instruct families to teach these things to their children and their children’s children have taken root in the culture of the Jewish people. That is why it has been important for us to take a closer look at the foundations and the culture. We’ve also mentioned the model. The model established by Abraham of the community being nurtured by being God-centered and entrepreneurial is a core premise in understanding Jewish business secrets. My friend Bill Bolton, entrepreneurial expert, author and former Cambridge professor explains that there are many types of entrepreneurs other than classic and business entrepreneurs. There are serial entrepreneurs who specialize in starting something new and getting them profitable, then turning them over to someone else to operate, as they move on to the next entrepreneurial challenge. However, what I’d like to share is about a man whose natural gift combines two very potent types of entrepreneurship. It is a story demonstrating my point about how the model, the gifts and the culture are engrained in Jewish mind-sets. This is the story about a friend of mine whose name is Joel. Joel is a non-practicing Jew. He believes in God and similar to the many Christians who also are “non-practicing” in their faith, his time of devotions is generally limited to times of crisis and what in Judaism are known as the High Holy Days or what in Christendom would be the major Christian holidays. I’m also going to mask some of Joel’s story, simply to protect the very wonderful and meaningful role he has come to assume in his adopted Asian nation. It was about a decade and a half ago, when Joel was winding up a Master’s degree program in Hong Kong, that he took a long weekend to go visit an Asian country he had always wanted to visit. He fell in love with the people and the culture and knew he would soon be going back. When he returned, not unlike the experience I had with my sensibilities being assaulted by the level of poverty I saw in Ethiopia, Joel was exposed to the plight of the disabled and disfigured in this fast emerging nation. Many were shunned by their families who concluded the lame and disfigured had been cursed. Although many were very gifted in many ways, few were able to attend college with far too many not even finishing secondary school. Those who were able to find work were destined to long hours and very low pay in factories with little to no opportunity for advancement. Far too many had become street beggars. Being gifted as both a social and serial entrepreneur, Joel put together the training needed to operate a number of unique small businesses, which Joel started. Some of these businesses had markets in his adopted country and some he sold by means of shrewdly-designed relationships with major online distributors. He soon rented an old villa in a more inexpensive part of his city. He provided dormitory type of living spaces for the men and the same type of sleeping room for the women. He provided someone to prepare basic, but ample meals of their culture. With several dedicated work spaces for the different enterprises, most mastered the training quickly and soon became a part of the businesses Joel had started. Joel’s original goal had been to provide these people the training and experience to be able to start their own businesses. Some did, but most who became a part of his efforts found the purpose and the dignity of these arrangements to be far greater than anything they had ever experienced in their previous work settings. So, as the process developed, Joel made arrangements for those who wanted to stay to have a share in the profits that originally had been designed just to pay for the program. What was developing was exceeding expectations. God clearly was blessing them. Joel’s creativity and ability to bring increase while reaching out to disabled and disfigured men and women converged into something a lot more than what he anticipated. It all came together to create opportunity that exceeded expectations. Each of the factors we’ve been talking about have been operating in this illustration: the model, the gifts and the culture derived from these amazing people of business, the Jews. Isaiah, one of the Jewish prophets wrote about matters that are very close to the heart of God. He explained that when you help the poor and the needy, the underprivileged, then your light will dawn in the darkness and your darkness will become as noon-day. This prophet went on to write that when this is your focus, then the Lord will guide you continually and satisfy your soul in drought and strengthen your bones. You’ll be like springs of water whose waters do not fail. Yet, there is another dimension. It is entrepreneurship that more fully embraces the spiritual dimension. It means going beyond just the intellectualizing of the faith. There is another proverb that states: “In all your ways acknowledge Him and He will direct your paths.” It becomes much more personal in the way both individuals and communities of God’s people put their faith in action and map out their destinies. It involves making God the Senior Partner of their business. For God to be Senior Partner means that we proactively need to be depending on His guidance in our planning. For many, breaching that threshold can be downright scary. We’re not going to cross that bridge quite yet. Nevertheless, hearing God on specifics has been frightening to the very people whose Patriarchs were known for doing so. When Moses led the Israelites out of captivity from Egypt, the people themselves were terrified when God spoke. Far too many thought they would die at the sound of His voice. So they begged Moses to take his conversations with God elsewhere and then return to them and tell them what God had said. Even years later, when God appeared to Gideon, His first words to Gideon were: “Peace be with you. Do not fear. You will not die.” For both Jews and Christians, this reluctance to bridge the gap in learning to discern the voice of God has paralleled the institutionalizing and intellectualizing of the faith, with the result dampening that dimension of the supernatural power that could be operating through God’s people. We will be taking up the subjects of hearing God’s voice, along with planning in conjunction with the Holy Spirit in future sessions. Entrepreneurship is about opportunity and risk and the response in terms of strategy. We have suggested that at the core of Jewish business secrets is a different way of thinking. Part of this difference in mind-sets is the entrepreneurial way of thinking. Entrepreneurial thinking is just as valid for startups as it is for multinational corporate enterprises. Now, in keeping with embracing new mind-sets, I’d like to describe what can happen when making God your Senior Partner. It affects not only your destiny but the way the spiritual supersedes the natural with the operation of our enterprises. Indeed it incorporates a different way of viewing things. Jewish entrepreneurs have a different way of looking at community, which gets back to the model. We will explore this important dimension of community in more detail in another session. When God in-fact becomes Senior Partner of an enterprise and more so within a community that adheres to this premise, then the dynamic I describe as God’s economy is released. Let me illustrate. After Abraham had led a very meaningful and full life, his son Isaac assumed his mantle and was pursuing the destiny that God had promised to Abraham’s descendents. There then came a season of famine that made Isaac want to move and find more fertile land in which to live. However, God spoke to Isaac and told him to stay in the land that God had given to his father. In doing so, all the blessings God had promised to Abraham would manifest for Isaac. So scripture tells us that Isaac stayed. According to what he heard from God, Isaac then sowed his seed in a place of famine, as God had instructed, a place where nothing had been growing. In the same year of this planting, he reaped a hundred-fold. The story continues by stating that from this point, Isaac began to prosper and continued prospering until he became very prosperous. So it was that in a land where nothing had been growing that Isaac heard from God and obeyed. The oppression created by the famine had no power to impede Isaac’s efforts. The result not only blessed Isaac, but it captured the attention of the heads of other societies in the area. It is written that Abimelech went to Isaac with the commander of his army wanting to establish a treaty with Isaac because he had seen that “God was with him.” God’s economy is released when the practice of making God your Senior Partner, of listening carefully to and heeding His voice with decisions and planning, becomes foundational to the way a business and a community is operated. God’s nature is to create, innovate, build and multiply. These dimensions are the very foundation of what we call entrepreneurship. When God is made Senior Partner with an undivided heart, then the application begins releasing God’s economy and the potential for an exponential multiplication. Let me give you an example from some other people we know. In a poor, rural area of Vietnam we conducted one of our entrepreneurial workshops. This workshop was attended by a pastor who had started several home churches in the region. This pastor was very poor. He didn’t even have the funds needed to pay the tuition for his children to go to secondary school. After attending our workshop, he was praying and thinking about what I had said about commercializing a gift. Both his wife and his mother were excellent cooks. He also remembered that there was a breakfast noodle business in a good location in his community that was shutting down. He had a strong perception that God was telling him that he should buy the equipment from the owners and reopen the breakfast noodle business. He borrowed the money from people who trusted him and that’s what he did. People in the community were curious about this pastor. There had been a lot of rumors about what kind of a man he was because he had been arrested for his church activities. So, word got around about he, his wife and mother starting this small, breakfast noodle business. People first came because of their curiosity about this pastor. Then they found that his wife and mother had excellent recipes and the breakfast noodles they served were especially delicious. They also found that they really liked this affable pastor and the way he was always helping others in the community. In only one month, this new business was making a profit and starting to grow. Small specialty eating places. 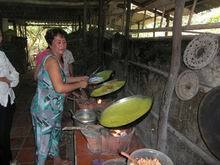 serving only one dish, are very popular in Vietnam. While this pastor’s wife and mother spent more time than he did with the business, this breakfast eating place was open just a few hours every morning. He spent about three hours each morning while it was open, meeting and talking with members of the community, assisting his wife and mother where needed in serving the tables. Rather than distracting his pastoral responsibilities it augmented them. More than the additional income, this simple business enabled him to meet with people in the community he might never otherwise have met. Also, not only did the income it created enable them to pay the tuition for their children’s education, but after the business grew, they also set up an education fund to help some of the other poor families in his community with scholarships. Entrepreneurship challenges the status quo. It releases the creative and establishes a new order of things. One of the best descriptions of an entrepreneur found any place in scripture is found in the final chapter of Proverbs, a chapter describing the type of woman every man wants for his wife. In the midst of this description of an “excellent” woman are the qualities incorporated in an effective entrepreneur. This proverb notes that: “She considers a field and she buys it.” The woman entrepreneur wisely identifies opportunity and decisively takes advantage of it. The passage goes on to state that: “Out of her earnings she plants a vineyard.” The woman entrepreneur makes her assets work for her. This proverb continues by stating: “She sets about her work vigorously.” Diligence and hard work are cornerstones for successful entrepreneurship and God’s economy. The woman in this proverb was a good steward. This proverbs continues: “She sees that her trading is profitable.” Increase and profit are a vital part of operating any enterprise. “Her lamp does not go out at night.” Dependability requires sacrifice to get the job done with excellence. What is being described in this approach that merges the spiritual, community and entrepreneurial is not only a different way of thinking. It also releases a creative advantage. We’ll be talking more about this creative advantage that results from this new way of thinking in a future session. The creative that reflects the foundations of Jewish business secrets incorporates vision, an investigative approach, imagination, planning, strategy and excellence. When combined with prayer, God as Senior Partner and faith, it brings about results that most usually exceeds expectations. Let me conclude with the story of a company we were familiar years ago that gives a gripping example of this different way of thinking and how expectations can be exceeded. In the mid-1970s the Williams Companies was a small, respectable pipeline company. There then came a time, when Joe and John Williams, the founders recognized what they felt was unusual opportunity in their market. They decided to make a corporate acquisition as a part of their growth strategy. In a highly competitive world, we sometimes need to have our vision expanded. I’m not suggesting recklessness or presumption. However, true entrepreneurship and God’s economy employs faith in dealing with risk, but faith that has done its homework and is willing to work hard to achieve unusual goals. 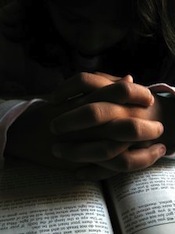 There is an old saying among faith-based people: “Pray as if it all depends on God. Work as if it all depends on you!” This is Morris Ruddick. During our next session I want to talk about the gift of community.